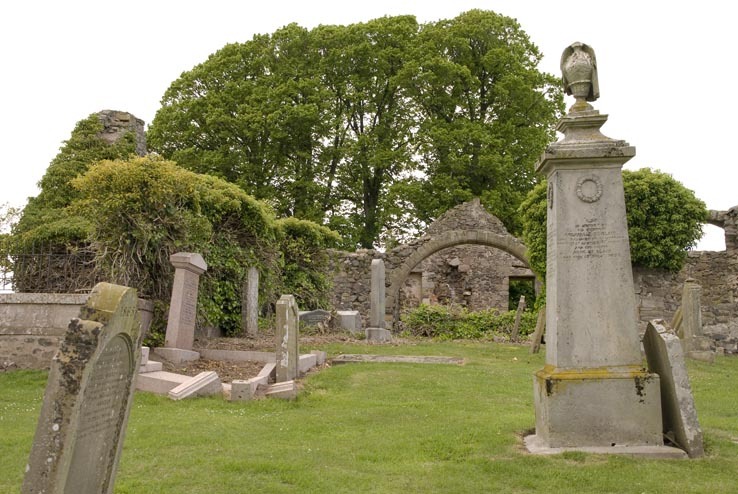 The terms kirkyard, churchyard, graveyard, burying ground, old burying ground and even cemetery have all been used over the years to describe tbis location. It is also named as either Forgan or St Fillans. For the sake of clarity, I have used Forgan Kirkyard on all the pages on this website. 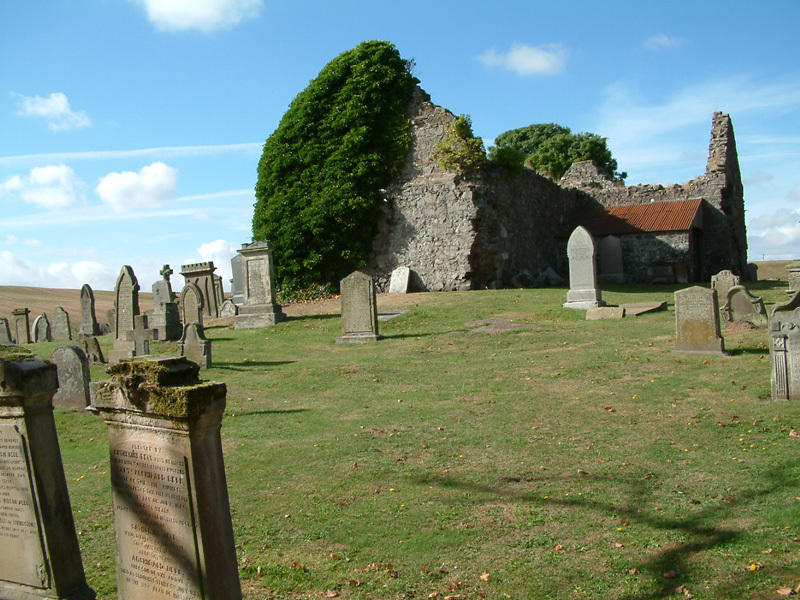 St Fillan's Church at Kirkton in Forgan parish, Fife, was founded in 1124. The building, with many alterations, was in use until 1841. The kirkyard was in use for several centuries. In 1879-80, the walls of the old session house in the kirkyard were removed to provide additional space for burial. From 1883, the Heritors & Parochial Board were seeking additional space - either by extending the existing kirkyard or by choosing another site. 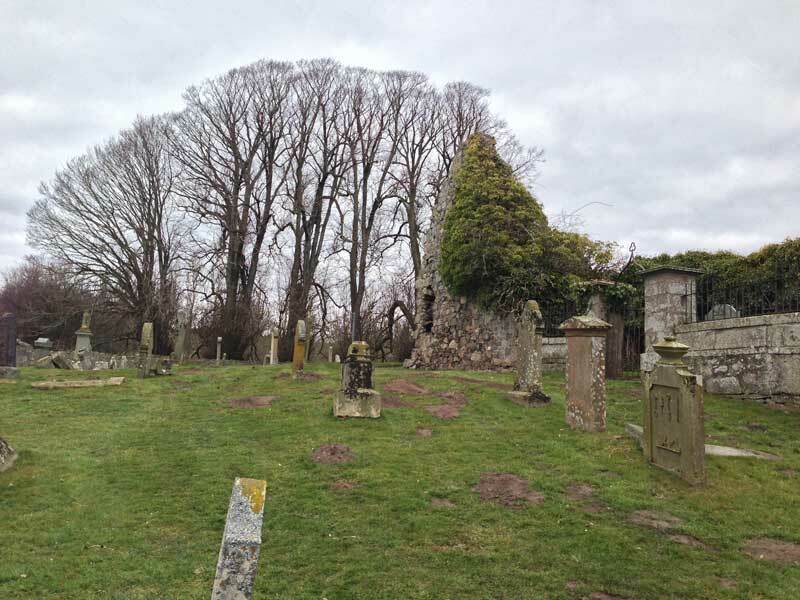 Space was so limited, that some Forgan inhabitants bought lairs in Ferryport-on-Craig Cemetery (in Tayport) which opened in 1887. After much searching and argument, land was eventually purchased and Vicarsford Cemetery (half a mile to the west) was opened in August 1894. It is believed that no new lairs were created at Forgan although existing lairs continued to be used. The Heritors continued to employ their own gravedigger until June 1908, when the gravedigger at Vicarsford took over. In 1874 it was decided to make a plan of the kirkyard and a corresponding record. 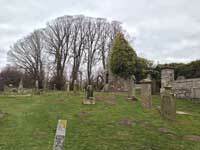 In 1885 the arrangement of lairs in the kirkyard was adjusted, and marker posts were provided. A kirkyard book was kept by the sexton, and there were also some kirkyard cash books. (ref. Heritors Minutes). Despite extensive searches, the only records which have been found (*) are in a gravedigger's book Record of Interments in Forgan Kirkyard from Whitsunday 1899 to . This book gives date of burial, name, lair number, place of death and fees paid. Where I have been able to match interments with gravestones, I have added the reference number of the monumental inscription beside the lair number given in the gravedigger's book. I was able to draw up a tentative lair plan based on this information which showed that the lairs were numbered as follows: standing at the gate facing south, each row of lairs is lettered from A (at the west wall) to Z (in the east). Each lettered row is then numbered from 1 (at the north wall) increasing towards the south. I have added these 1885 lair letters to the bottom of the plan of the kirkyard. * When I wrote the original book**, no other records or plans had been found. The gravedigger's book was held by Fife Council Archives in Markinch. Now (2018) a further volume of interments covering 1874 to 1899 has been located at Fife Archives (now in Glenrothes) but I have not yet examined it, and the gravedigger's book covering 1899 onwards is no longer listed in the Fife Archives online catalogue. Some stones were recorded by Jervise (1893), the Royal Commission on Ancient & Historical Monuments (1933), di Folco (1969) and Mitchell (1971). This list contains all the inscriptions which were legible over the period 1992 - 1997. A few stones lie face down and await possible recording in the future. Record of Interments in Forgan Kirkyard from Whitsunday 1899 to . This volume is held by Fife Council Archives, Glenrothes. ** This information was originally published in Forgan Kirkyard - Monumental Inscriptions and Mortcloth Records by William Owen, published Dundee, 1997, Tay Valley Family History Society.